Within the general dispirited mood and tensions in which the European project is often ignored by a poorly informed – if not deliberately misled – public opinion, the sudden awakening of thousands of youth that it is “their” future that is being threatened by global warming, is creating a faint new hope that – if properly managed – could transform the coming European elections into a major political event. The questions relating to global warming are emblematic of preoccupations that are better dealt with by the EU (climate does not recognize Member State boundaries), only authority that can ensure that the welfare of its citizens in general prevails over partisan “national” interests. This challenge should also be capable of mobilizing an electorate that, otherwise, shows little motivation for European matters; in addition, it constitutes a powerful argument to fight the programs of nationalist/populist parties. The election campaign is a particularly appropriate moment to bring additional pressure to bear on the political class by demanding of the candidates – and therefor of the parties they represent – that they commit explicitly and irreversibly to address climate change. The youths who parade in Belgium every Thursday and whose numbers are exploding do not only represent tomorrow’s electors but are – as of today – capable of exerting considerable influence over their parents and friends who are old enough to vote. No responsible party will be so foolhardy as to ignore the message! Within the movement in Belgium, schoolteachers have played a very constructive part organizing debates with and among pupils. It would be most welcome if such initiatives could encompass providing information on how the EU functions, its purpose and its values, a subject that is woefully absent of the school curricula. 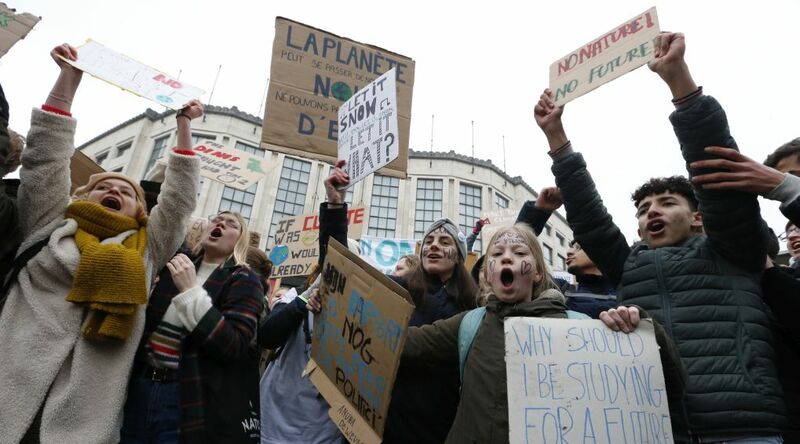 This sudden focalization of youth on climate change has turned “viral” on social media and led to the invitation of a 16 year old Swedish girl to the COP24 in Poland and to Davos, the Mecca of finance and globalization. Even the rarefied world of Central Banks has been infiltrated, raising the question of the bearing of climate change over “monetary policy”; this underlines the short rather than medium or long term relevance of the question, which must be incorporated at the very heart of social and economic planning of any self-respecting government. It is absolutely essential to demonstrate the relevance and added value brought by the Union to this key area, all the more that its many passed contributions are regrettably overlooked. For instance, the peace that has prevailed inside the Union over the last 70 years is directly threatened by the consequences of climate change. Indeed his phenomena will only increase migratory flows, abetting the fallacious arguments of extremists in favor seeking protection behind “national” borders which, once independent, they will prove incapable of defending. On the eve of launching the European parliamentary election campaign, one must seize this unique opportunity to extend the movement to all school populations within the EU; to recommend to this upcoming generation to formulate its demands to aspiring candidates; to encourage pupils to influence their parents and friends to participate massively in the poll and take into account climate change when voting. • The appeal by Bernard Henri Levy, seconded by thirty international authors, which calls upon all those “who are not willing to accept passively the impending catastrophe: One must – when populist sirens are blearing – sustain Europe or drown”. A short lived window of opportunity is opening: let all who aspire to protecting our civilization, its values and to transmitting a habitable planet to future generations, engage resolutely in order to transform the forthcoming European elections into a massive tribute to the solidarity among its citizens.